Recently released smartphones and tablets have been evolutionary with incremental hardware improvements so it’s been sometime since I’ve reviewed a new smartphone or tablet which elicited a wow like the Sony Xperia Tablet Z. When I first saw the Xperia Tablet Z, I knew this was an Android mobile device which would shake things up thanks to its slim 6.9mm thick, water and dustproof form factor weighing in at just 495 grams. The first time I picked it up, I looked at it sideways and was genuinely impressed that Sony had managed to fit all the necessary ports and battery while creating a tablet that’s significantly thinner than other 10” inch tablets and amazingly also thinner than the popular iPhone 5 and Galaxy S4 smartphones. The Xperia Tablet Z goes into battle against formidable tablet competitors including the Google Nexus 10 and 4th generation Apple iPad. They are both significantly thicker and heavier than the Xperia Tablet Z but balance that with larger battery capacity, higher screen resolution and slightly faster speeds. The Xperia Tablet Z shipped with Android 4.1.2 which is one version behind. Sony promises that it will be updated to 4.2.x soon. While Sony have made changes to the stock Android software it has not been heavy handed and the modifications do not appear to slow down the tablet. My only suggestion to buyers would be to replace Sony’s custom keyboard software with the much better Google Nexus Keyboard which is available for free from the Play Store and can be switched to with ease. The first strength of the Xperia Tablet Z is how thin and light it is. At 495 grams it’s 24% lighter than a 4th generation iPad and 18% lighter than a Google Nexus 10. Secondly the Xperia Tablet Z is IP57 certified with ports sealed by protective flaps. To use the other tablets in a tough, wet or dusty environment would require a special case that would increase total weight even more. Thirdly viewed subjectively the Xperia Tablet Z has a cool factor that no Android tablet has had to date. Now onto weaknesses. While the Xperia Tablet Z’s LED-backlit LCD screen is not quite as high resolution as the Google Nexus 10 and 4th generation Apple iPad it’s quite bright and displays images / videos very well. As an unavoidable result of how thin it is the 6000 mAh battery capacity is only 2/3rds that of the Google Nexus 10 and just over half the size of the 4th generation Apple iPad. Speakers are placed at bottom left and right corners on the sides. Volume level is OK but not very loud and audio quality is a bit tinny. Business or home users who need a tough 10” inch tablet that’s light enough to hold in one hand, is IP57 certified for use in damp or dusty environments, with a shatterproof and scratch-resistant screen and a high resolution 8MP camera, may find the Xperia Tablet Z a great match for their needs. The Xperia Tablet Z will not suit everyone but it has an undeniable cool factor and several key features that are unmatched by competitors. There will be plenty of buyers who will find it irresistible. 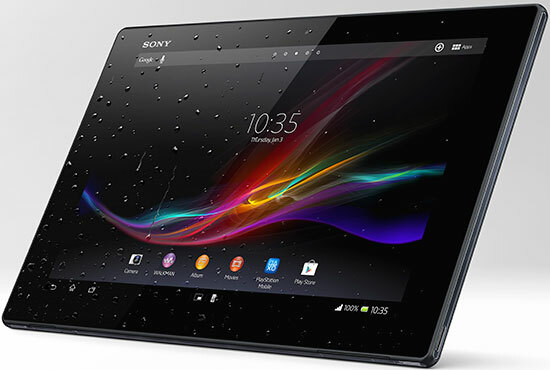 In terms of pricing the Sony Xperia Tablet Z ranges from $539 for 16GB WiFi, to $679 for 16GB 4G & Wi-Fi. Paying $649 for the Xperia Tablet Z 32GB Wi-Fi seems pointless when you could buy the cheaper 16GB WiFi model and add up to 64GB storage via the microSD slot or buy the WiFi and 4G enabled model instead for better connectivity. In comparison the Google Nexus 10 is $469 16GB and $569 32GB with no expandable storage or LTE option. The 4th generation Apple iPad has 8 models with no expandable storage, ranging from $539 for 16GB WiFi to $1009 for 128GB WiFi and 4G. It is surely not the worth of price. Anyways a very nice review. It cleared my thoughts of buying it or not! 🙂 Cheers!